The Eden Central School Alumni Association and the Eden Athletic Hall of Fame announce the formation of a cooperative venture to resurrect, rejuvenate and reactivate the Hall of Fame which has not held a formal induction ceremony since 1999. The Eden Athletic Hall of Fame was originated in 1991 with the induction of 5 charter members and had 53 members on its roster. Since then it has grown! The Eden Athletic Hall of Fame established a new steering and nominating committee under the chairmanship of retired school administrator Don Fregelette. The committee has elected a new class of members to the Hall of Fame in 2008, 2009, 2010, 2011, 2014, 2016 and 2018. Mission Statement: To recognize and honor those coaches, administrators, individuals and/or teams who attended Eden High School and excelled athletically while demonstrating a high degree of sportsmanship. leadership and character. 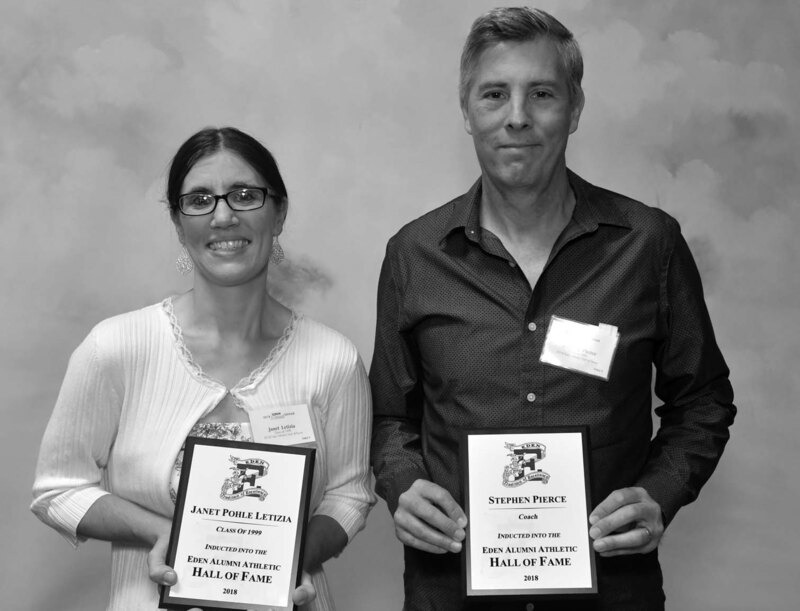 The Eden Athletic Hall of Fame inducted a new class on July 28, 2018 during Alumni Weekend. We currently have 96 individuals and two teams in the Hall. Athletes who graduated at least five years prior to induction, coaches and sponsors are eligible for nomination. Once nominated candidates are sent a questionnaire that needs to be returned by late January to be considered for that summer’s induction. The Eden Athletic Hall of Fame will induct a new class in 2020. To nominate someone for consideration in the Eden Athletic Hall of Fame (HOF), please send the candidates name, address, phone number and/or email address to the HOF at edenalumni@gmail.com or by mail to Eden Alumni Society, Eden Athletic Hall of Fame, P.O. Box 66, Eden, NY 14057. The Selection Committee must be able to contact the nominee. The Hall of Fame Selection Committee is made up of coaches and Hall of Fame members. We currently have two vacancies and are looking for Hall of Fame members willing to serve on the Selection Committee. The Hall of Fame is completely self-supporting and receives no financial assistance from the Eden Alumni Society or Association. Your generous contributions to the Hall of Fame will make future inductions possible.